Cory Turner in Victory Lane at Ohsweken Speedway on Friday, June 15. (Photo by Dale Calnan/Image Factor Media). CAISTOR CENTRE, Ont. – June 19, 2018 – Cory Turner got past Tyler Hendricks on the final lap of the 20-lap 360 Sprint Car Feature to score his first win of the 2018 season in his KT Tobacco/Silo Wireless sponsored No.97 last Friday night at Ohsweken Speedway. He followed it up with a third-place finish on Saturday night at Brighton Speedway with the Southern Ontario Sprints. Cory had a tough road to victory on Friday, racing forward from seventh to fifth in his heat race in order to qualify as the final redraw car. Starting eighth in the 20-lap Feature, Turner methodically made his way forward. Following the final caution on lap 12, Turner was embroiled in a heated battle for second with Jim Huppunen. The win was Turner’s third in a 360 Sprint Car and second of his career at Ohsweken. 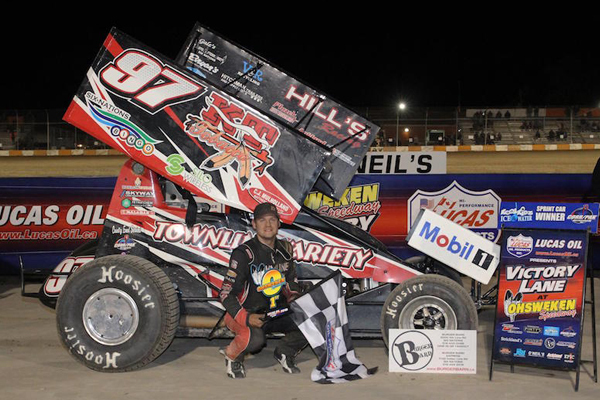 Following the win, the team had little time to celebrate as they performed maintenance and made changes to prepare for the Southern Ontario Sprints season opener at Brighton Speedway on Saturday night. Turner raced to a third-place finish in his heat race to qualify for the redraw where he pulled the seventh starting spot for the main event. He wasted little time driving forward and was up to fourth by lap five and then had to work hard to chase down Kyle Fraser for the runner up spot after getting past Jake Brown. He eventually drove up to second before falling back to third after a tough battle amongst lapped traffic with Dylan Westbrook in the caution-free race. The 25-lap feature was completed in six minutes, 17 seconds, falling just 11 seconds shy of the track record. Turner will be back in action at Ohsweken on Friday, June 22 and plans to compete on Saturday, June 23 at Merrittville Speedway with the Southern Ontario Sprints. For additional event information, visit www.ohswekenspeedway.ca and www.merrittvillespeedway.com. Error: Error validating access token: Session has expired on Wednesday, 26-Sep-18 21:50:24 PDT. The current time is Wednesday, 24-Apr-19 21:03:49 PDT.